by Bill Dwight on Wednesday, February 20, 2013 at 12:21 PM | LEAVE A COMMENT! 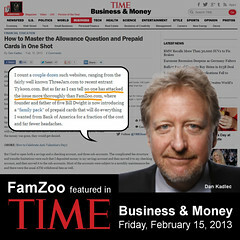 Last Friday, our soon-to-be-released prepaid card family pack capability received some truly wonderful coverage by TIME’s Dan Kadlec. Dan was kind enough to spend quite a bit of time with me walking through a very detailed online demo of the pre-release family packs that we’re currently testing internally with FamZoo and TransCard families. Check out his write-up here: How to Master the Allowance Question and Prepaid Cards in One Shot. Funny Famzoo shows no link to the terms and conditions. Sometimes those don’t show up till the sign up page but there is nothing there either. That is usually a sign that something isn’t right. They are hiding something or a link to the accounts terms and conditions would appear somewhere. They are not a bank. Are funds FDIC insured by a Bank? What are the associated fees for ATM usage, for transactions etc. None of this is mentioned. The list of partners shows no bank listed. Dan mentions that the card can be loaded by a Bank account for $3 or so (he apparently cannot remember an exact number) and says that is the last fee you’ll see. However what happens the next time you load money? Ooops, there is that $3 fee popping up again. Dan forgets to mention that ACH transfers between banks (again what bank is behind FamZoo?) take 2-3 business days so when junior needs the latest game that night he has to wait for 2-3 days. A transfer between accounts at Bank America would be instant. Jim, skepticism is good a good thing, so I respect your concerns, and let me do my best to address them. First, we’re still testing the product prior to its launch in the next 1 to 2 months, so that’s why we do not list the issuing community bank and the cardholder terms on our site yet — nor do we have a link to order the family packs just yet. What we do have is the ability to reserve a spot for one of the first 1,000 family packs which will be offered to subscribing members of FamZoo at no additional charge to what our subscribers are paying today for our current Virtual Family Bank offering. Our current pricing starts at $5.99/month if you pay recurring monthly, or you can pay in advance for up to 2 years for just $60. Family Packs will be available at FamZoo.com (we’ll be working with a specific issuing bank which we’ll announce when the family packs are available), and they will also be available in co-branded form through a variety of community banks. As for fees, the goal is to subsume as many fees as possible into a single predictable monthly fee and eliminate random usage fees. The one area that is tricky is loading the “funding card” from external sources. We can’t control what some banks will charge. E.g., Wells charges me $3 to transfer to my funding card (3-5 days), but I can do it for free via Dwolla (but it takes longer). We’re expecting that our partner community banks will offer that service for free when transferring from one of their bank accounts. That said, our whole design goal is to make those external loads very infrequent. On the other hand, the very frequent transfers between parent and child cards within a family pack for allowance, chores, parent-paid interest, penalties, etc are all completely free and immediate. That’s because they are card-to-card transfers within our control. As long as you keep your funding card reasonably well stocked, you can shoot the money to junior’s card to buy his “latest game” immediately — but I recommend you make him save up his earnings for it first! As I said, Jim raises excellent questions, and we hope you won’t hesitate to contact us with more. Just comment below or hit the Contact Us link on our site if you’d prefer to communicate with us privately.